Chalet Chenavray is a charming traditional-style chalet with all the 3-star modern conveniences you need to make your Alpine holiday perfect. Set over three floors, the accommodation is arranged so that the ground floor is a self-contained apartment, ideal for a couple who are looking for a little bit of privacy. Spacious balconies, a deck and a terrace mean everyone can find their own place in the sun, and there’s covered parking for two cars, so even in the winter your car is snow-free and ready to go. 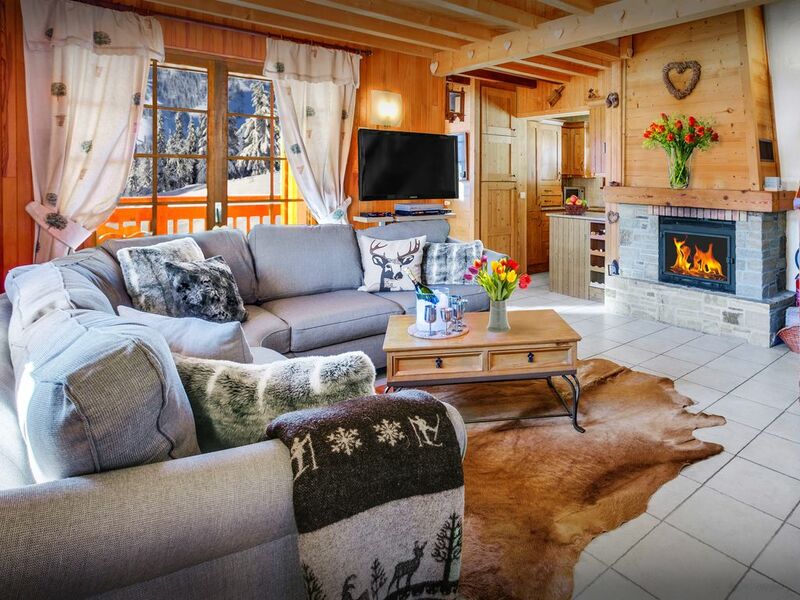 This delightful chalet is just five minutes by car from Manigod village, where you can pick up fresh bread from the boulangerie or enjoy a locally-sourced meal at Val Sulens restaurant, which also does takeaway food. A lot of care has gone into furnishing Chalet Chenavray so that 10 adults can enjoy each other’s company without falling over each other. The ground floor studio has an open plan sitting, dining and kitchen area, as well as a shower room and a bedroom. On the first floor, you'll find the main living area, with a cosy L-shaped sofa in front of the fireplace and access to the terrace, a dining area and fully-equipped kitchen. There's also a double bedroom on this floor, a shower room and the sauna. The laundry can be reached through the garage. On the top floor, the master suite has an en suite shower room, a dressing room and access to the balcony - it's the perfect spot for that first cup of tea in the morning, or to soak up the last of the sun as it sinks down behind the mountains. There is another double bedroom and a twin room on this floor, which share a bathroom. After an energetic day skiing or walking in the mountains, it’s great to come home to the log fire, or perhaps ease those aching limbs in the sauna before sharing your memories of the day over a fondue and a glass of wine. With the ski bus stopping 250m from your door, and the nearest lifts just 5km away at the Croix Fry sector of the La Clusaz pistes (altitude 1500m), you’ll waste no time getting to the pistes. A single Aravis ski pass gives you access to the 95 lifts and 220km of runs which link La Clusaz and Le Grand Bornand, and there are plenty of mountain restaurants where you can meet up with friends for lunch. The nearby Beauregard plateau is a great choice for cross-country skiing and snow-shoe walking. Non-skiers can go ice-skating or swimming in La Clusaz, where the heated indoor and outdoor pools are open all year round - there’s nothing better than floating in the steaming outdoor pool while the snow-covered mountains tower above you! In the summer, walking in the mountains is a pleasure, and all the hard work is done for you if you take the cable car to the top and come down at your own pace! The Gliéres plateau, scene of the Resistance’s campaign in World War II, is a great place for a picnic. Adrenalin junkies can try paragliding, canyoning, climbing, mountain-biking or white-water rafting - just some of the activities on offer within a few miles of Manigod. Via ferrata is a great family day out, with children as young as eight able to explore the mountains on iron walkways, secured to a harness. After a strenuous day, you’ll be glad to get back to your chalet for a barbecue on the sunny terrace. The medieval lakeside town of Annecy is just 30 minutes away by car and is a great place for a day out, whatever the season, with its unique mix of restaurants, shops and museums. In the summer it's a great place for water sports, or hire a boat and explore some of the quiet lakeside beaches. Whatever you do, you can be sure of a holiday you'll never forget. Please note that the downstairs apartment is only accessible via outside, and separate from the upper level. The drive can be tricky in the winter even when cleared of snow, you may prefer to park by the road and walk up (approx 50m). Nous avons apprécié au chalet Chenavray : la vue qu'on avait, le confort, les environs, la livraison du pain tout les matins. Dans la région nous avions la chance d'avoir le choix entre les montagnes et le Lac d'Annecy. And I really enjoyed the beautiful nature and kind locals. I feel quite sure that I will be visiting your house again next year if possible !! We enjoyed our stay as always. A magical start to Christmas for us and our children. The chalet was beautifully decorated for the season! It's been everything we had hoped for and more! We look forward to being able to return sometime in the future. We booked the house for one week in summer with four adults and six children. The area is really beautiful in summer and there is lots to do for children. The house is relatively close to the road to La Clusaz but you have stunning views from the two terraces. We used the four bedroom as well as the independant apartment and thought it was no problem that they are not connected. The house was very well presented and clean and although the kitchen is small it was extremly well equipped. The whole house is well equipped. The bedrooms are cosy with good mattresses. The dining table is big enough for ten. I think the living area would be a bit of a squeeze with ten people in winter, but then you would have a big room downstairs as well. It is very good value for money in summer and we would recommened the chalet. Chalet Chenavray has been a magical place for a family reunion with family travelling from Australia, UK and Switzerland. It's warm, cosy, comfortable, well equipped and peaceful. We've had a very enjoyable week.